Try your old New England favorites with a touch of Southwestern heat. Ginger Jelly - 2 1/2 oz. Made from the exotic ginger root. Ginger Jelly - 7 1/2 oz. Hot Blueberry Jam - 2 1/2 oz. Bursting with wild hot favor. Hot Blueberry Jam - 7 1/2 oz. Hot Cinnamon - 2 1/2 oz. Hot Cinnamon - 7 1/2 oz. Hot Garlic Jelly - 2 1/2 oz. Garlic & jalapeno peppers blended to perfection. Hot Garlic Jelly - 7 1/2 oz. Hot Strawberry Jam - 2 1/2 oz. America's favorite with a hot twist. 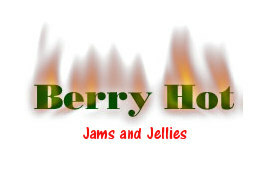 Hot Strawberry Jam - 7 1/2 oz.